A drone interrupted firefighters battling the 4,700-acre Cold Fire in Yolo County, Cal Fire said Friday. Despite having to temporarily pause operations, fire crews have reached 30 percent containment on the blaze, located west of Winters near the Napa County line, according to Cal Fire. It is unclear who was flying the recalcitrant drone, but Cal Fire officials used Twitter to say, "Remember #IfYouFlyWeCant." 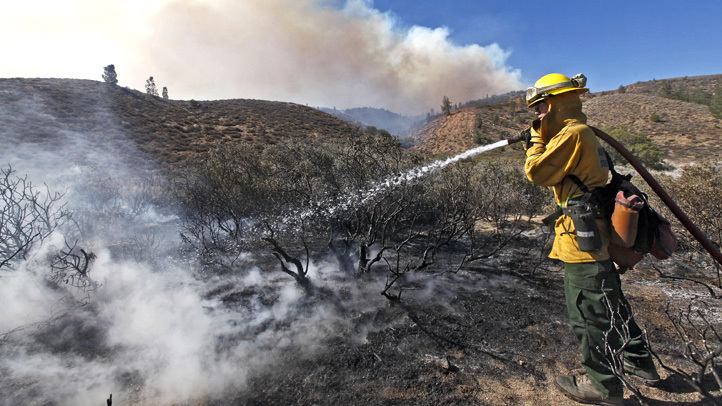 The Cold Fire started around 4:32 p.m. Tuesday off state Highway 128 east of the Monticello Dam. There are roughly 1,625 firefighters on scene constructing, improving and maintaining containment lines around the fire, which crews expect to have under control by Tuesday of next week. Fire crews are also using 109 fire engines, 20 water tenders, 19 dozers, 11 helicopters and two air tankers, Cal Fire said. Highway 128 remains open with traffic control in place, but Thompson Valley Road is closed at Highway 128, according to Cal Fire.